About 11 to 15 billion years ago all of the matter and energy in the Universe was concentrated into an area the size of an atom. At this moment, matter, energy, space and time did not exist. Then suddenly, the Universe began to expand at an incredible rate and matter, energy, space and time came into being (the Big Bang). As the Universe expanded, matter began to coalesce into gas clouds, and then stars and planets. Our solar system formed about 5 billion years ago when the Universe was about 65% of its present size (Figure 5a-2). Today, the Universe continues to expand. Figure 5a-1: Hubble Space Telescope view of a distant cluster of galaxies near the beginning of time. (Source: AURA/STScI). Figure 5a-2: Our solar system began forming about 5 billion years ago as gas clouds coalesce into planets and a star. 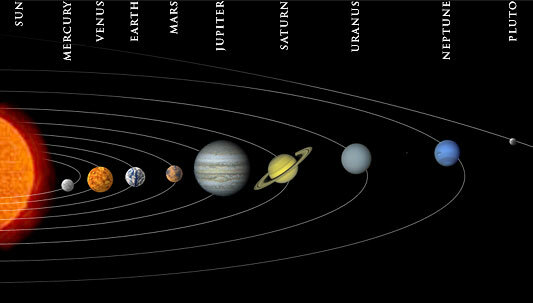 Today, the solar system contains nine commonly recognized planets and the Sun. (Source: NASA). Why do Most Scientists Accept the Big Bang Theory? If the Big Bang did occur, all of the objects within the Universe should be moving away from each other. In 1929, Edwin Hubble documented that the galaxies in our Universe are indeed moving away from each other. The Big Bang should have left an "afterglow" from the explosion. In the 1960s, scientists discovered the existence of cosmic background radiation, the so-called "afterglow" after the Big Bang explosion. Our most accurate measurements of this cosmic radiation came in November 1989, by the Cosmic Background Explorer (COBE) satellite. The measurements from this satellite tested an important prediction of the Big Bang theory. This prediction suggests that the initial explosion that gave birth to the Universe should have created radiation with a spectrum that follows a blackbody curve. The COBE measurements indicated that the spectrum of the cosmic radiation varied from a blackbody curve by only 1%. This level of error is considered insignificant. If the Universe began with a Big Bang, extreme temperatures should have caused 25 percent of the mass of the Universe to become helium. This is exactly what is observed. Matter in the Universe should be distributed homogeneously. Astronomical observations from the Hubble Space Telescope do indicate that matter in the Universe generally has a homogeneous distribution. Cosmologists have postulated two endings to the Universe. If the Universe is infinite or has no edge, it should continue to expand forever. A Universe that is finite or closed is theorized to collapse when expansion stops because of gravity. The collapse of the Universe ends when all matter and energy is compressed into the high energy, high-density state from which it began. This scenario is of course called the Big Crunch. Some theorists have suggested that the Big Crunch will produce a new Big Bang and the process of an expanding Universe will begin again. This idea is called the oscillating Universe theory.